Villagers should give quests, and give items in return (like cloathing/emerald). The quests should feature basic tasks and objectives. Some tasks might include: "We need wheat to harvest. Replant our crops with Wheat. ", or "Pigs are stepping on our crops. Kill 10 of them within the area of the village." Once again, these are basic examples to get the general idea flowing. It is suggested that quests should be related to the biome they are picked up in. The quest log will feature 3 different randomly picked quests and you have the ability to do them if you're the level, or above the level required (just like the Enchantment Table!). You will not lose you level and experience, like the Enchantment table. Instead, when you complete the quest, you gain EXP (the EXP gain will be the same for every quest, no matter the level or objective). The items in return will vary depending on what the level requirement for the quest you're doing is. A picture of a quest log, given to you by a villager that gives quests. A picture of the quest log, given to you by a villager when you have a completed quest. It is determined what villager opens the quest log by the colour of clothing the villager wears. The colour will be unique (by this, I mean that only villagers with this clothing give quests). If you like the idea, please support it by bumping the thread... Thanks! It's a nice idea, but I don't think quests would really fit well in minecraft. Also, I don't think the development team real like making players do chores, that's why the achievements aren't 'Chop 1000 trees' or something, so adding in fetch quests and such would go against that vision. Perhaps adding in more achievements, particularly ones related to villagers, might be the way to go, instead of being assigned quests by them. Quests would be different from achievements, as you actually get something in return, hence why you would do the quest. Also note, if we can interact and trade with villagers, then I'm sure villagers can give quests and such for rewards. On another note, Minecraft is a big chore. The point of Minecraft is to get resources and survive... And I don't see the Minecraft team stopping you from needing to work (which is where I think you're getting at with the user chore thing). Well, villagers do technically already give you fetch quests. In a way but there isn't really much of an objective, so this would be different. That is an amazing concept picture. I support this idea. Some people are worried about this not being in Minecraft's "theme". Back in beta 1.4 did you think villagers, golems, and trading woud fit Minecraft's "theme"? Also there is a solution. If quests are added and you don't want to do them.... Then don't do them. You don't have to do the quests. Thanks you for the complement (and support!) :). Edited/updated example trade log, looks more neat and organised now. Thanks you for the complement (and support!) . Edited/updated example trade log, looks more neat and organised now. Your welcome. I'll visit your thread often and coninue to support it. 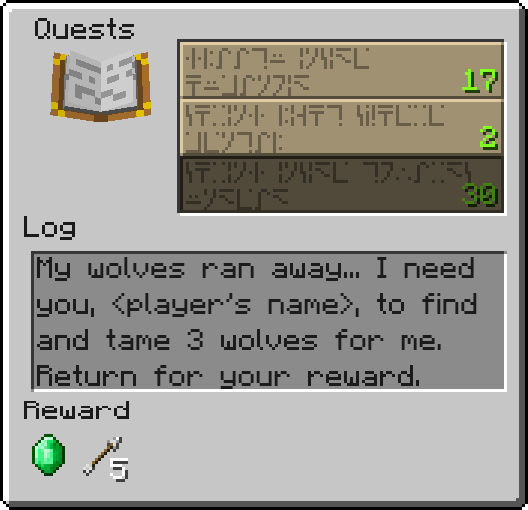 I would really love to see quests implemented into Minecraft. "I would really love to see quests implemented into Minecraft." I think it'll add more "level" to the game... Will definitely make people want to play more consecutively. Back from my trip, uploaded the newer picture of the quest giving log and the quest returning log. I really love this idea! This should definetly be in the game! Maybe like the wolf quest thing you would know which wolves are his/hers because they would have blue collar and they are by a giant tree. What do you think? Well maybe we should get rewards for achievements? And I didn't say villagers were incapable of assigning quests, I'm sure they could. Although I can't say I'm happy about dialogue, since they don't really talk, but I digress. And you are right, you can do chores and such in minecraft, but the devs don't make you do the chores, you assign them to yourself. If you decide to make a large wheat farm and take care of its daily upkeep then that it your own business. But it is not necessary to win the game, or obtain a reward or achievement. I'm not against quests, but I don't want to be assigned a bunch of busy work to earn some meagre rewards. If they were added, I would want something more fulfilling, and due to minecraft's open world nature, I don't think it's possible. Except in adventure maps. With better rewards and more exploration aspects, the quests would have me actively searching for a village to build near. This is the greatest idea I have seen in the Minecraft Forums in a while. I hope Notch or Jeb reads this. Someone please pin this. P.S Great image examples! Overall, I think nate890 has a solid suggestion. It's simple, enhances the functionality of villagers and villages, and (contrary to some people's opinions) does seem to fit in with the general design vision that the MC development team appears to have. When I play MC, I like to create and explore. I'm not really into grinding - be it materials or XP. I think quests give us a fun alternative to earn emeralds and/or XP without forcing the player to grind (or cheat).